Adds new objects and activities that bring joy to colonists. Adds the ability to brew a variety of drinks. Adds small features for a starting colony, or one without power. Adds new drugs to help with pain, focus, speed, and infections. (CPD) Sodas can use fruit from Vegetable Garden. Allows colonists to exchange modded resources of the same kind. Includes templates for custom recipes. Adds various zen and rock garden themed decorations. Adds powerful amulets left over from an ancient civilization. Adds new power features and expands existing ones. Allows burning of non-colonist corpses for fuel. Adds new alloyed metals for creating buildings, weapons, and art. Adds a quarry for collecting resources in flat terrain. 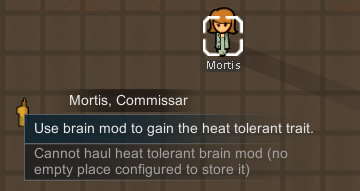 Adds BrainMod devices for giving traits to colonists. Adds small things to craft and sell to traders. Source Files: Constantly up-to-date source files on GitHub. Rainbow Petals: Harvested from the Spectago flower, these petals can be used by other mods to make tea, soda, or paint. Fresh Water Bucket: Fresh water gathered from a well. Bottled at the crafting table, brewery, or stoves to get Bottled Water. Bottled Water: Provides a slight mood boost. The base for most Soda Brewing drinks. Rubber: Baked from raw rubber in the furnace. Bucket of Asphalt: A mixture of rubber, sand, and gravel which can be used to make Rubberized Asphalt flooring. Food Rack: Provides a simple storage solution for foods. Does not keep foods fresh, however. Medical Rack: Provides a simple storage solution for medicine. Universal Rack: Provides a simple storage solution for most things. Well: An expensive and time-consuming structure that allows colonists to gather clean water. 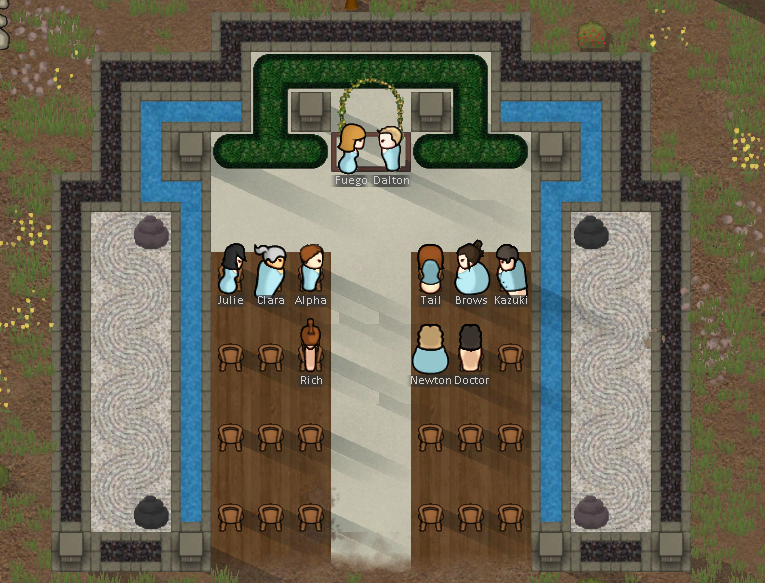 Colonists can also gather around it and socialize. StuffedVent: Another type of vent. Uses stuff instead of steel. Can be toggled to prevent equalization. Individual Table: Small 1-person table. Useful for bedrooms and prison cells. Stump Chair: Outdoor-themed chair. Slightly less comfortable than a stool. Simple Crafting Table: Allows for simple crafting jobs. Window: Built into a wall. Allows sunlight to come inside. Colonists can look out for joy. Rubberized Asphalt: Flooring that offers enhanced movement speed. Chandelier: A 2x2 overhead light source made using stuff and glass/fused quartz. Not for swinging from. Quern: A large metal or stone mill used for grinding resources. - Activate the mod in the mod menu in the game before activating other cuproPanda mods. Allows colonists to exchange modded resources of the same kind. There are templates included for players/modders to easily make their own recipes. All recipes are contained in this folder. This mod adds new objects and activities that bring joy to colonists: board games, arcades, paintings, bookcases, medicine, and more! Pile of Books: Crafting ingredient for the Reading Table and Bookcase. Purchased from Joy Traders, Exotic Traders, and Bulk Goods Traders. Also made by combining 3 Written Books. Spectago Tea: A simple cup of tea. Heats up quickly for enjoyment at any time. Paper: Brewed from either wood of cloth. Used to make books. Crafted at the Brewery. Blank Book: Used by an artist to write a book. Crafted at the Writing Desk or bought from exotic/joy traders. Written Book: Can be sold for a high price. 3 can be crafted into a Pile of Books, which can be used for crafting. AEA tank: Fuel for the thurible. Cartridges: Arcade games that can be loaded into empty arcade cabinets. Card Table: A table perfect for a colonists bedroom or for an entertainment room. 1-4 players. RimColony: A special board game purchased from traders. 1-4 players. Book Storage: Book Rack, Bookshelf, and Bookcase. Upgradeable book storage for colonists to read books at. 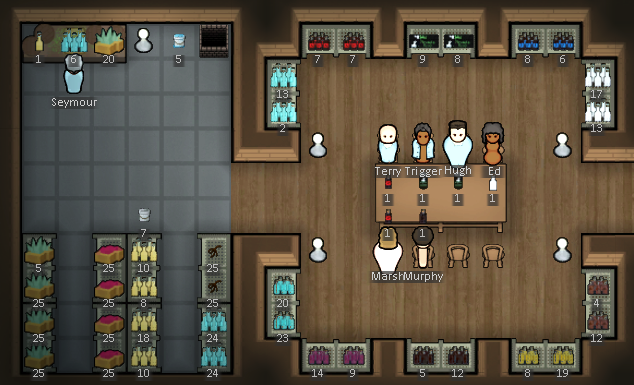 Reading Table: A table for a colonist to read books at. Provides passive joy. Easel: Can be used to craft paintings, and colonists can also doodle on it (meditative joy). Painting: Provides beauty and joy for colonists. Be careful! An untalented artist can make an ugly painting! Dartboard: Colonists will stand at a distance and throw darts at the board. Special thanks to Haplo and their Miscellaneous mod, the source code helped clear things up! Arcade Construction Table: A station for duplicating arcade cartridges, crafting empty arcades, and adding cartridges to empty arcades. Arcades: Entertain colonists while giving a small amount of XP to the skill listed below. All arcade cabinets are purchased from pleasure cruisers or exotic goods traders and consume 200W of power. v2.75 - Requires Community Core Library. 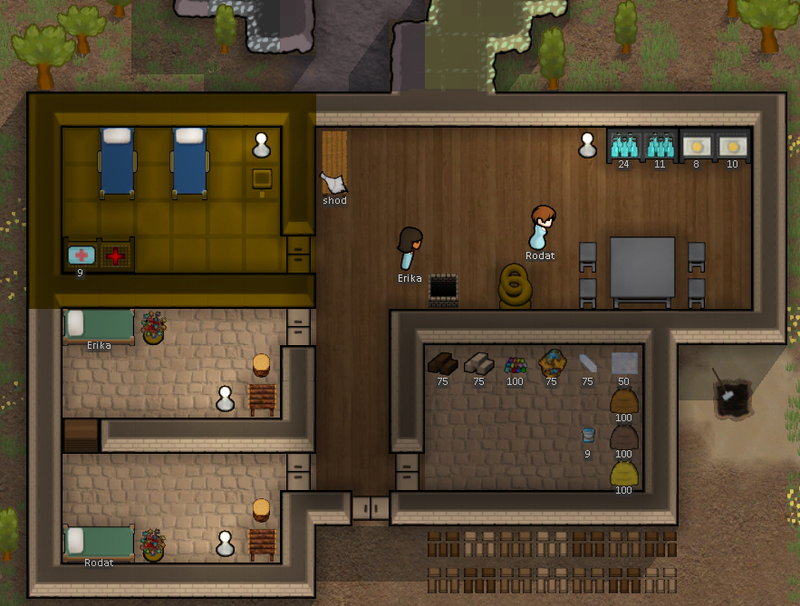 This mod adds the ability to brew sodas, coffee, and new types of alcohol. Syrup: Required sweetener for sodas. Requires 10 corn, agave, or berries. Bulk job available at the brewery. Frass Root: A root crop used to make root beer. Cannot be used to make food. Alcohol Crate: A crate containing 75 bottles of alcohol - stacks up to 2 for easy storage. Decaf Coffee: A delicious preparation of roasted and ground coffee beans without caffeine. Pleasurable to drink. Seltzer Soda: Carbonated Water. Requires Bottled Water. Agave Soda: Requires 20 Agave, 1 syrup, and Bottled Water; makes 6. Berry Soda: Requires 20 Berries, 1 syrup, and Bottled Water; makes 6. Root Beer: Requires 5 Wood, 10 Frass root, 1 syrup, and Bottled Water; makes 6. Chocolate Soda: Requires 2 chocolate, 3 milk, 1 syrup, and 6 Seltzer; makes 6. Beer: RimWorld's staple alcoholic beverage. Barrel recipe available. Nigori: An alcoholic beverage made from rice. Barrel recipe available. Vodka: An alcoholic beverage made from potatoes. Barrel recipe available. Whiskey: An alcoholic beverage made from corn. Barrel recipe available. Wine: An alcoholic beverage made from berries. Barrel recipe available. Coffee: A delicious preparation of roasted and ground coffee beans. Pleasurable to drink, and it restores 10% rest. Dead-eye Coffee: A strong preparation of roasted and ground coffee beans. Not pleasurable to drink, but it restores 20% rest. Thrumbo Energy: Energy drink to perk up colonists. Restores 30% of Rest, and colonists will automatically drink it if they are tired and have 4 or more hours to be awake. Cannot be crafted. Koka: An uplifting soda popular throughout the galaxy. Cannot be crafted. Peppi: A stronger version of Koka, Peppi is known for its stimulating properties. Restores 5% of Rest. Cannot be crafted. Coffee plant: A tree for growing coffee beans. Grows rarely in the wild in some biomes. 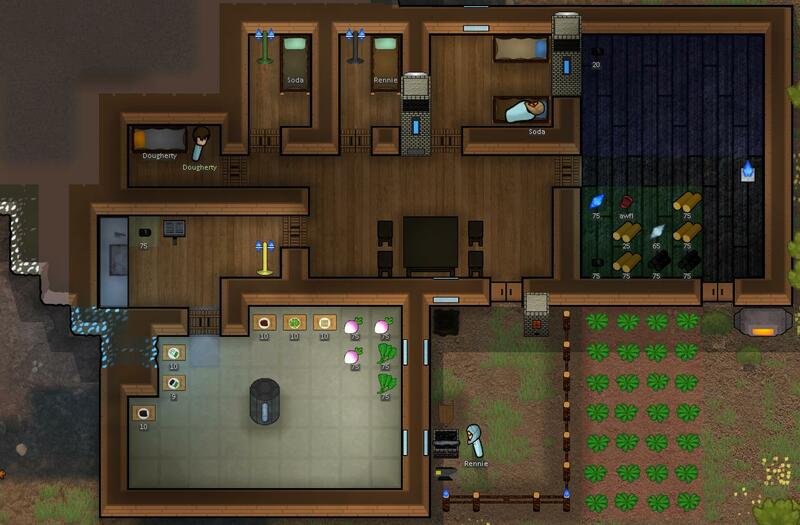 This mod adds sodas using ingredients found in the Vegetable Garden mod. Syrup: Can now be made at a standard cook stove using 6 sugar. Sodas: require 20 food, 1 syrup, and bottled water; makes 6. - Activate the mod in the mod menu in the game after you activate Cupro's Drinks. For license terms regarding the Vegetable Garden mod, please see the Vegetable Garden page. 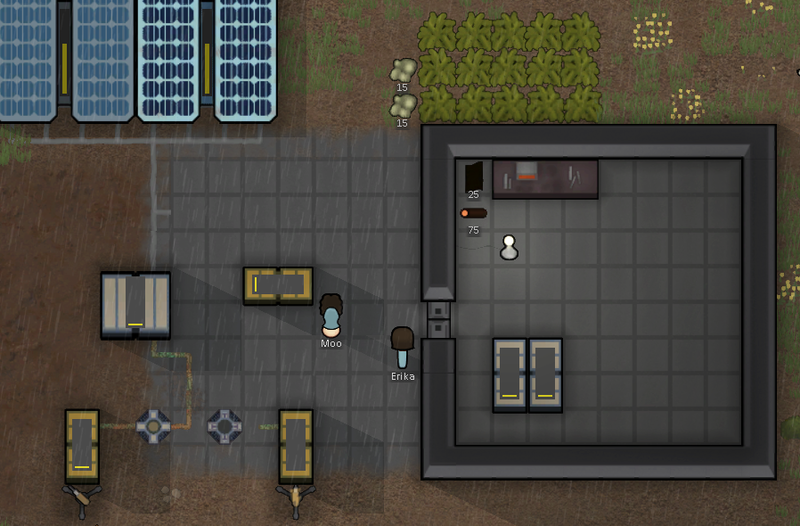 This mod adds small features for a starting colony, or one without power. Using this mod, I like to go 6 months to a year before getting any power going! Charcoal Chunks: Made at a campfire or grill. Used as fuel for the grill. Grilled Meals: Come in three varieties: Meat, Veg, and Fine. Provide a small mood bonus, but are slightly more time consuming to make. Smoked Meat: Like grilled meals, but last for 20 days before rotting. Turnip: Yields both turnips and turnip greens. Turnips last for a long time, but the greens don't. Turnip Salad: 5 turnip greens can be combined with 5 vegetables to make a salad. Keffiyeh: A large cloth wrapped around the head which can cover the face when needed. Helps insulate the wearer from the elements. Yakisugi wood: Wood that has been carefully charred to both preserve it and make it more fire-resistant. Can be used to make yakisugi flooring. Glowstone: Rare rocks which radiate blue light. Can easily be found at night or bought from exotic goods traders - no hellish trek necessary for these glowstones. Coldstone: Rare rocks which radiate coldness. Can be used to make Coldstone Batteries. Grill: Alternative to the campfire for powerless meal production. Simple Door: Quick to open, but quick to destroy. Can only be made out of wood. Log Fence/Gate: Fence for protecting a garden. Does not support a roof, and colonists can shoot over it. Glowstone can be placed on top to provide light. Hide Bed: Better than a sleeping spot. Crafted using animal leathers, and color is determined by leather used. 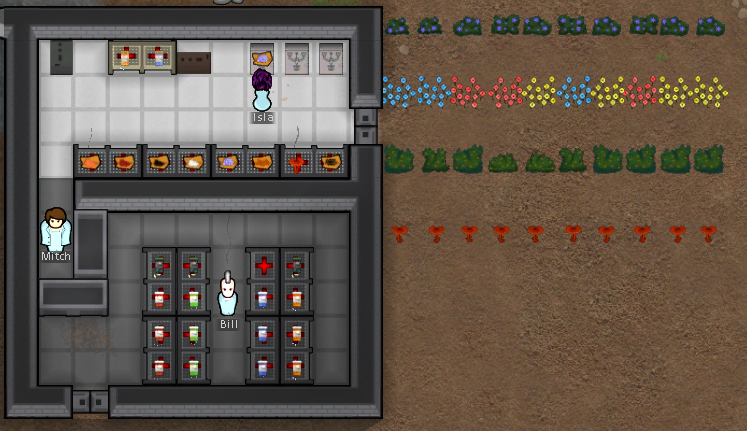 The pillow changes color to show if the bed is for colonists, prisoners, or medical. Wood-Burning Crematorium: Cremates corpses using wood. Charcoal Pit: A pit dug into the ground for burning a large amount of wood. Pylon: A simple structure for lighting paths. Glowstone Lamp: A lamp supporting two large glowstones. Smoker: Stone building that can be used to slowly cook meats, preserving them for a short period of time. Bellows: Speeds up the crafting speed of the forge and charcoal pit. Solar Chimney: A tower which uses sunlight and evaporating rainwater to cool incoming air down to a comfortable level. Coldstone Battery: A tank which can cool a room to below freezing when supplied with Coldstones. Fence Gate (ugly rotation): Fence gates should only be placed allowing travel in a north-south direction. Gates placed on their sides do not match up with the fence posts, but otherwise work exactly the same. Adds new recipes using bamboo from the Vegetable Garden mod. 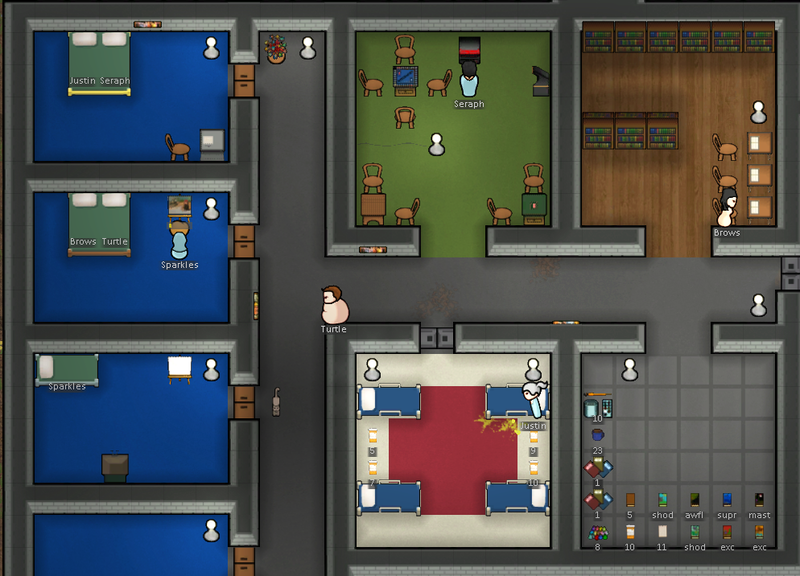 This mod adds new purchasable drugs to help with pain, focus, speed, and infections. Also adds the ability to make knockoff versions of the drugs, as well as a pharmaceuticals trader that sells medications and occasionally body parts. Pill Press: A station for manually pressing pill tablets from raw ingredients. Medicine Blend: Made from herbal medicine and papaver seeds, is more potent than herbal meds. Papaver: A hardy ornamental plant that is known for its pharmaceutical uses involving pain. Strychcyx: The berries grown on this bush are exceptionally bitter. The seeds within are used as muscle stimulants among indigenous tribes. Vinawinkle: A viny bush with periwinkle flower petals. The petals contain alkaloids known to improve cognitive processing power. Reishitake: Mushrooms popular among disease-stricken colonies, the Reishitake are best known for their immunity boosting properties. Methophine: Medical strength painkillers with minimal side effects. Knockoff recipe available. Psystimall: Medical strength psychostimulants. Known to cause hallucinations. Knockoff recipe available. Amp: Medical strength muscle stimulants. Knockoff recipe available. Anmibene: Medical strength antibiotics. Knockoff recipe available. ZDC: Stolen military grade stimulants used by quick-response scout snipers. 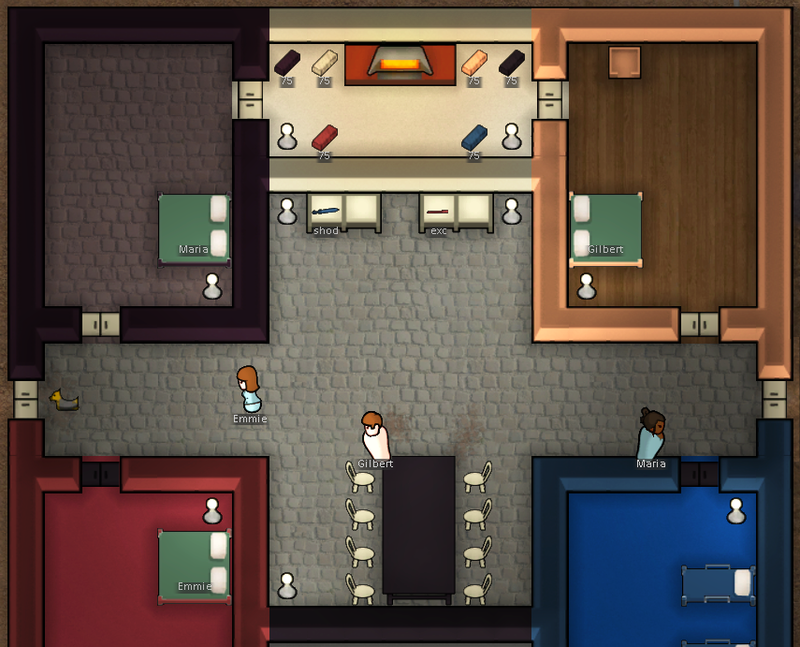 Drug Crash: Colonists who take Methophine, Psystimall, or Amp have a very rare chance(~1/50) to crash when the effects wear off. The effects of a crash last for about half a day, and result in a poor mood, as well as lowered consciousness/manipulation. Knockoff medications increase the chance this effect will happen. 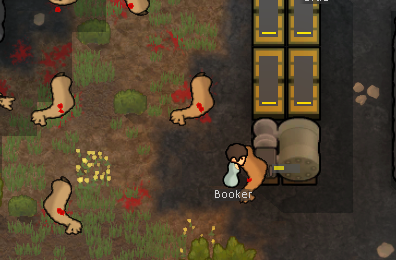 Intoxicated Wandering: Colonists who severely overdose(player driven) have a chance to wander around intoxicated, not doing what they should. 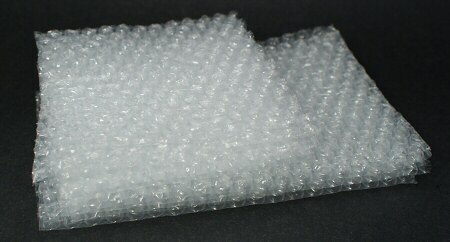 The effects last for about an hour, and never result in violence. Knockoff medications do not affect the chances of this happening. v2.02 - Requires Community Core Library. - Activate the mods in the mod menu in the game. This mod adds various zen and rock garden themed decorations. Researching stonecutting unlocks everything. Border Path: A nice looking border for placing along important paths, hallways, farms, etc. Border Path Pillar: A pillar made to fit along a border path or border pond. Can be used to support roofs. Curved Gravel: A single tile that can be rotated and placed to create curves, circles, spirals, etc. Linking (graphical conflict): Any mod that uses the Custom4 or Custom5 linkFlags will allow Border Path/Pond to connect with things they shouldn't. This is purely an aesthetic issue, and from what I have seen, no mods use these linkFlags. This mod adds amulets left over from an ancient civilization. Some believe their powers are magical, other believe they come from technology long forgotten. 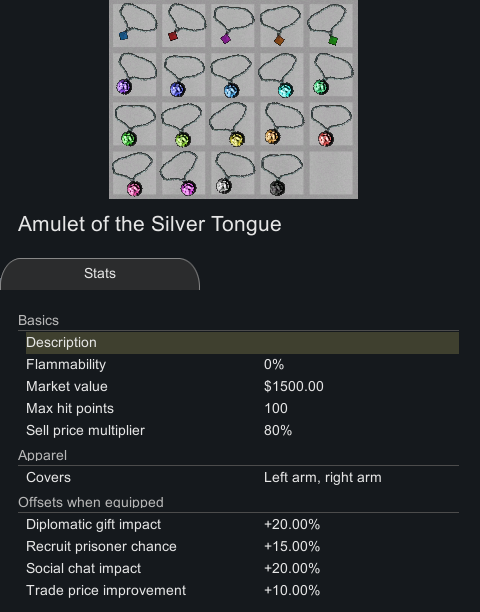 These amulets are hard to find, and they are expensive, but they provide a good boost to certain stats for your colonists. Only 1 necklace and 1 ring can be worn at a time. Rubber wood: Similar to regular wood, but with a tan-white color. Insulated cable: Used for making power related objects. Made at the smithing tables using rubber and copper. Daylight Sensor: Allows power to flow through it while exposed to the sun. Inverted Daylight Sensor: Allows power to flow through it while not exposed to the sun. Rubber Tree: Grown to produce latex and rubber wood. Grows in the wild in most biomes. Adds a generator fueled by corpses. Show your enemies you mean business! Corpse-Fired Generator: Burns non-colonist human corpses for 500 Wd of power. Adds new mid-game/end-game alloyed metals for creating buildings, weapons, and art. Adds a variety of floors. Some are free, some require stone, and some require metal. Some of the designs are based on patterns from texturemate. I highly recommend you check them out! 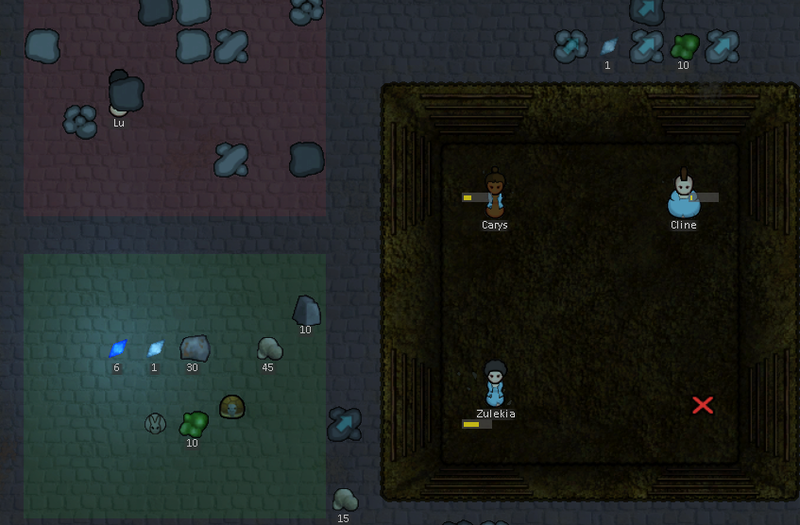 This mod adds a quarry for collecting rocks and resources in flat terrain. Up to four colonists can work at it. Quarry: A large pit dug into the ground for digging. Click once to select a quadrant, click twice to select the entire quarry. Quadrants can be forbidden, and the entire quarry can be deconstructed. Adds brain mod devices for giving or removing traits. Adds small things to craft and sell to traders. Drinkware offers two tiers of crafting. Nice. Now i can play MintCraft when playing Rimworld! Let's not forget Rum Swirled! Yo, Dawg... Eh, maybe not. I had hoped to get so much more done this weekend, but 5 new things will do for now. Hmm.. a stack of PlayGalaxy magazines, perhaps? Or possibly a "massaging" station? I created the arcades as an .xcf so I can easily add more games later; I'd like to eventually have one for every skill. For those who downloaded: How does the joy speed and XP gain feel? I'd optimally like the arcades to be slightly more fun than chess/billiards since they are more interactive, and keep the colonists sharp on their skills -maybe adding a level or two after a while of playing, but not acting as a replacement for doing the actual thing (hunting, crafting, etc. ).